We come out for home consultations for all shower estimates. It is important for us to view the space and review your hardware choices. For budgetary purposes, the "average" price is around $1,400. When your tiles and marble are in place, please give us a call and we'll be glad to come out. Don't forget to ask us about our Glass Sealer. This makes a big difference fighting water stains and clean up. Simple and easy, transform your regular shower stall into something clean, crisp and easy to clean. Clean and open looking, with the glass cleaner, a squigee is all you really need to maintain your enclosure. Multiple configurations are possible to fit your opening.. Options include towel bars, hooks or a flip open transom for steam showers, just to name a few. Some clients are concerned about the hard water we have here in the region, you can opt for a glass sealer that resists stains or choose a pattern glass. Possibilities are waiting for you. 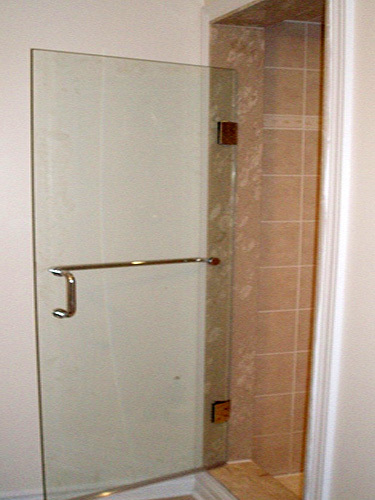 Let Newmarket Glass Mobile custom design a glass bathtub enclosure to fit your specific requirements. For information give us a call, send us an email or drop into the store. We offer a product called Bio Clean which works well with removing water stains from existing showers. Much stronger than vim or comet yet good for the environment and not available in your local grocery store.